Can a Leaf Wetness Sensor be a Rain Detector? It is possible to have a day with numerous 0.1 mm increments of rain, followed by some evaporation, in which a rain gauge would not record any rain during the day. “Recent data from our weather station provided two examples of the offset in measurement associated with tipping bucket rain gauges. It started raining on campus last night at exactly 20:00 hours, as indicated by the response of the leaf wetness sensor (Figure 1). The first 0.1 mm tip of the rain gauge occurred about 25 minutes later (Figure 2). The resolution for most high-quality tipping bucket rain gauges is listed as 0.1 mm, but this is not the resolution for the first 0.1 mm of rain. Forests along the California coast and offshore islands experience coastal fog in summer, when conditions are otherwise warm and dry. 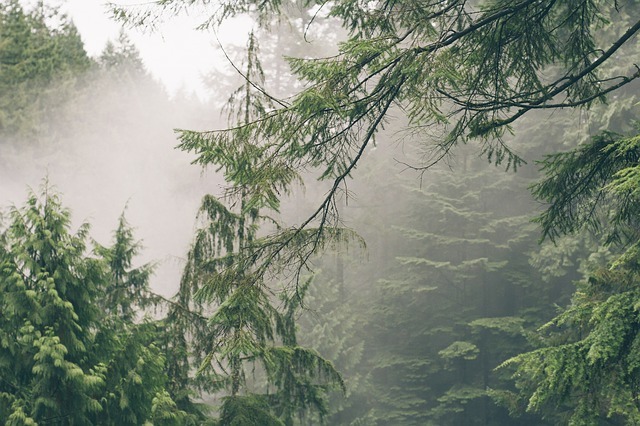 Since fog-water inputs directly augment water availability to forests during the dry season, a potential reduction of fog due to climate change would place trees at a higher risk of water stress and drought-induced mortality. Dr. Sara Baguskas completed her Ph.D. research in the geography department at UC Santa Barbara on how variation in fog-water inputs impact the water relations of a rare, endemic tree species, Bishop pine, located on Santa Cruz Island in Channel Islands National Park. The goal of her study was to enhance our ability to predict how coastal forests may respond to climate change by better understanding how fog-water inputs influence the water budget of coastal forests. Dr. Baguskas’ study seeks a better understanding of how fog-water inputs influence the water budget of coastal forests. Santa Cruz Island supports the southern extent of the species range in California, thus it is where we would expect to see a reduction in the species range in a warmer, drier, and possibly less foggy future. To advance our mechanistic understanding of how coastal fog influences the physiological function of Bishop pines, Dr. Baguskas conducted a controlled greenhouse experiment where she manipulated fog-water inputs to potted Bishop pine saplings during a three-week drydown period. She installed soil moisture (VWC) sensors horizontally into the side of several pots of sapling trees at two different depths (2 cm and 10 cm) and exposed the pines to simulated fog events with a fog machine. In one group of plants, Baguskas let fog drip down to the soil, and in another treatment, she prevented fog drip to the soil so that only the canopies were immersed in fog. She adds, “Leaf wetness sensors were an important complement to soil moisture probes in the second treatment because I needed to demonstrate that during fog events, the leaves were wet and soil moisture did not change.” Additionally, Baguskas used a photosynthesis and fluorescence system to measure photosynthetic rates in each group. The fog events had a significant, positive effect on the photosynthetic rate and capacity of the pines. Dr. Baguskas found that the fog events had a significant, positive effect on the photosynthetic rate and capacity of the pines. The combination of fog immersion and fog drip had the greatest effect on photosynthetic rates during the drydown period, so, in essence, she determined that fog drip to the soil slows the impact of drydown. “But,” she says, “when I looked at fog immersion alone, when the plant canopies were wet by fog with no drip to the soil, I also saw a significant improvement in the photosynthetic rates of these plants compared to the trees that received no fog at all, suggesting that there could have been indirect foliar uptake of water through these leaves which enhanced performance.” An alternative interpretation of that, Baguskas adds, is that nighttime fog events reduced soil evaporation rates, resulting in less evaporative loss of soil moisture. Baguskas is a USDA-NIFA postdoctoral Research Fellow working with Dr. Michael Loik in the Environmental Studies Department at UC Santa Cruz. She continues to study coastal fog, but now in strawberry fields. Her current research questions are focused on integrating coastal fog into water-use decisions in coastal California agriculture. She loves the work and continues to rely on soil moisture sensors to make meaningful and reliable environmental measurements in the field and greenhouse. In July of 2013, Lav Khot and his team were in the field looking at how cherries were picked, weighed, and transported, when suddenly a helicopter began circling around a nearby orchard block. When Dr. Khot asked the grower about it he said, “There was a rain last night, and we are trying to dry the tree canopies.” The grower told Khot that cherries are susceptible to cracking if moisture stays on the fruit too long, so they hire helicopters to fly over their orchards to remove water from the fruit and leaves, hoping to prevent fruit loss. The economic impact of solving the cherry cracking problem could be huge as growers now suffer heavy losses each year. Dr. Khot wondered if he could help the cherry growers make their decisions based on real data instead. He and his postdoc, Dr. Jianfeng Zhou, are using leaf wetness sensors to determine if and how long water is present on the tree canopies after a rain event. Dr. Khot hopes that the data from these sensors will help growers decide whether or not it makes sense to fly the helicopter. Irrigation: High water availability in the soil as the fruit is maturing (a few weeks before harvest) encourages trees to take up more water and causing the fruit to split. Rainwater: Rain collects in the cherry stem bowl or hangs off the bottom and is slowly absorbed into the fruit along the osmotic potential gradient. The fruit will start to split due to increased pressure inside the skin. There are two approaches to drying canopies. One uses a sprayer that produces a cross-wind that moves sideways through the canopies, while the other uses the downwash from helicopter blades. Last year, Dr. Khot and his research assistant experimented with crosswind velocities to see how much wind was being generated and how much water was really being dispersed. Dr. Khot commented, “Last season we went out to the WSU orchard and ran the sprayer at two settings in order to see how water was removed and how much wind was coming through the canopies for a given amount of time.” They had good success at both removing the water from the trees and measuring it with the leaf wetness sensors. But, they started the measurements after the cherries had matured, so weren’t able to tie it to cracking. One issue with using helicopters is that they are extremely dangerous. Accidents are not uncommon, and unfortunately pilots have died. This year the team will also evaluate the efficacy of a mid-size, unmanned helicopter in order to test if it can produce enough downwash to dry the cherries and compare it with manned helicopters. Dr. Khot says, “The helicopters are large and difficult to fly close to the canopies, but we can program the unmanned drone to fly close to the canopy and get rid of the water safely.” Digital Harvest and Yamaha, who are supporting this aspect of the research, have received an exemption from the FAA so they can test their unmanned helicopter. Dr. Khot’s team did their first experiments on traditional cherry tree architectures (imagine a typical tree), but this year they will perform their experiments on trees that are trained into a “Y” shape, or completely vertical. These trees represent traditional tree architecture, but this year researchers will perform their experiments on trees that are trained into a “Y” shape, or completely vertical. Researchers have developed these new architectures for ease of harvesting and management, but Dr. Zhou says that there will be less canopy variability and thus more interpretable results compared to the traditional tree architecture where wind velocity is more heterogeneous throughout the canopy. Can a Leaf Wetness Sensor Distinguish Fog From Dew? 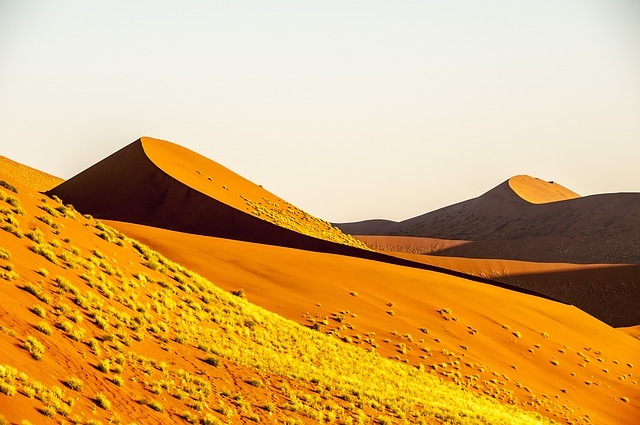 The Namib Desert on the Southwestern coast of Africa is hyper-arid in terms of rainfall but experiences frequent coastal fog events. The fog has been suggested to provide sufficient water for survival to certain plants which are endemic to the Namib, some of which occur only in the fog zone (up to 60 km inland). Dr. Keir Soderberg wanted to measure how much fog water plants were taking up either through surficial roots or their leaves. Dr. Keir Soderberg, former researcher at the University of Virginia (now a consultant at S.S. Papadopulos & Associates), wanted to use stable isotopes to measure how much fog water plants were taking up either through surficial roots or their leaves. 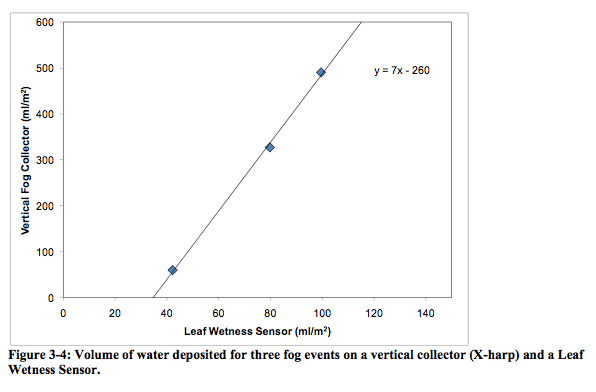 To enrich his data set, he decided to use leaf wetness sensors to show when the fog was occurring. He also wondered if he could use the leaf wetness sensors to distinguish between fog and dew. 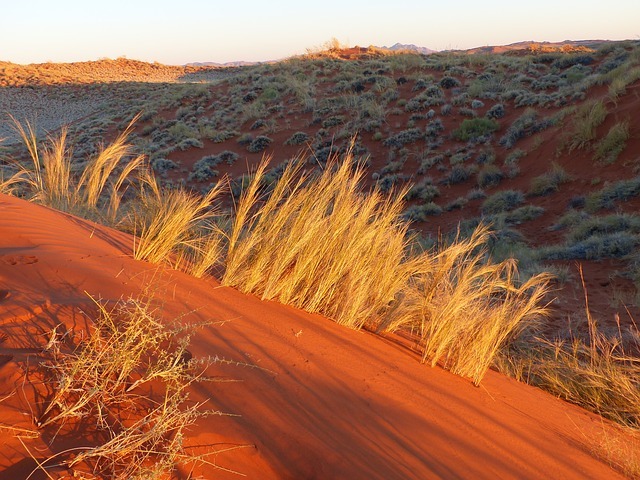 Keir set up five fog monitoring stations along a climate gradient in the central Namib. Each measured leaf wetness, air temperature, and relative humidity measurements along with solar radiation and soil parameters (moisture, temperature, and electrical conductivity). Stable isotope analysis of samples was also used to help quantify the amounts of fog, groundwater, and soil water that plants were using. Keir says, “We began collecting one-minute data to look at the different patterns of how the water was being deposited on the leaf wetness sensor. The dew tended to be more of a gradual wetting, but with the fog you would see these cyclical waves of steep wetting and then a little bit of a drying on the sensor.” Keir says he could look at those patterns and correlate them with visual evidence from his visits to the Namib during fog or dew events, though those wetting patterns may be specific to this location. In comparing different methods of measuring fog deposition, Keir concluded that it is difficult to compare across measurement methods. “There’s a lot of variability between methods, even if you are confident in your own device and its accuracy.” This gives the advantage to the most common measurement device, the Standard Fog Collector, since much of the work done through the years has used these instruments. However, the cylindrical-style collectors have the advantage of being insensitive to wind direction. Keir collaborated on a paper for The Journal of Arid Environments, called “The Nature of Moisture at Gobabeb, in the Central Namib Desert,” a compilation of different fog and dew collection techniques over the years, including leaf wetness sensors, for automating the identification of fog events. You can find it here. New fog monitoring stations are going up in the Namib through the programs FogLife and FogNet. 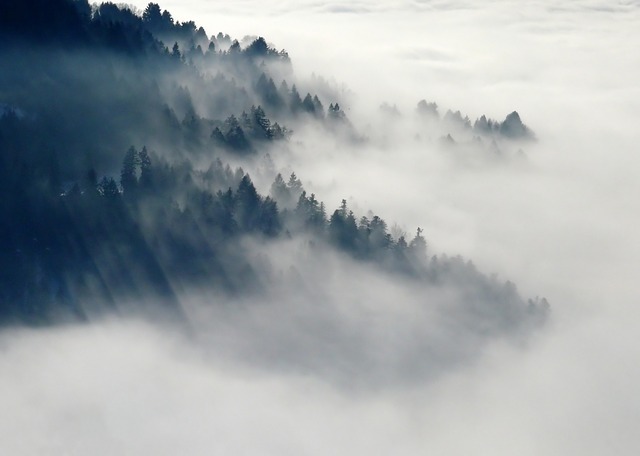 For a basic understanding of the role that fog plays in plant and ecosystem processes, read this article by Dr. Chris Still, who has studied this issue for many years in the Channel Islands National Park off of the coast of California.